SNES Classic Edition Apparently Confirmed In GameStop Meetings. We’ve heard rumours that a SNES Classic retro-based console like the NES Mini is coming this holiday season. Online gaming publication Destructoid claims to have heard further information about the device from a handful of GameStop managers. These managers claim to have been shown off the device in a private meeting with Nintendo. The SNES Classic is apparently due this holiday season. “Yes, there is going to be a SNES Classic. No, it does not have a release date. No, Nintendo would not confirm that a N64 Classic would be coming next year. With these plug-and-play systems, they want headlines and foot traffic, dude. Take it for what it's worth. I can guarantee I won't be spending two hours in the freezing cold standing in line for this one. I very seldom if ever play my NES Classic. ...and it's $80, so nearly $4 a game. REDMOND, Wash.--(BUSINESS WIRE)--The Super Nintendo Entertainment System, Nintendo’s follow-up console to the legendary Nintendo Entertainment System, launched in 1991 and introduced what many consider some of the greatest video games of all time – classics such as Super Mario World, The Legend of Zelda: A Link to the Past, Super Mario Kart, Super Metroid and F-ZERO. yeah, but it will be hacked again. And quite frankly, I would pay $80 for 5 of those games alone. I hope there are preorders for this. I got super lucky with my NES classic. I don't want to try that again. Very excited for this. All my must haves are on there. Gonna preorder I hope. Maybe they learned from the NES fiasco. To be fair that's less than half the price they sell these games for on virtual console and this comes with two controllers. Seems like a great deal. If it's easy to find, I'd love to get one. But I'm not gonna work and search for one. I can't support supply-chain business practices that were outdated in 1992. Very excited for this. All my must haves are on there. Gonna preorder but I hope they learned from the NES fiasco. It's a really good list of titles too. Maybe I'm just trying to talk myself out of getting one. Little surprised they didn't add Super Mario All-stars which is a great package and would make up for the lack of NES classic stock for people who wanted to play those games. They released a cartridge with Super Mario All-stars and Super Mario World together so it would have been easy. 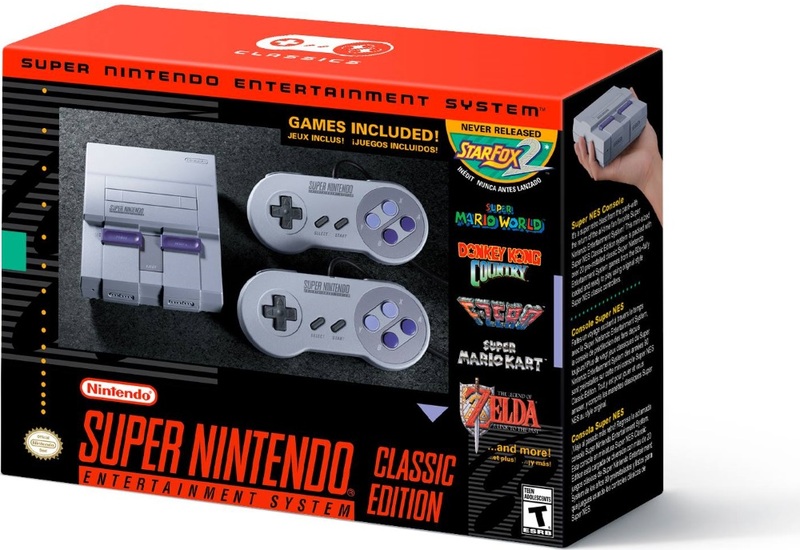 If this is going to only be available for a very limited time window like the NES Classic was and Nintendo yet again does not make any mention of that or market it that way, they're going to lose at least some goodwill with customers for these things. I look forward to never finding one in stores. I have all of these on my MAME machine and I still want to buy this. Hope they make it easier this time! Though I was randomly at Best Buy right before it opened yesterday and there was a short line out front of people who wanted Switches, so apparently they aren't that easy to find yet. I have seen them on shelves a few times but these folks lined up. Looks cool, but without a NES Classic to set it next to, I won't be hunting one out. They burned that bridge by not making more. So a lost sale there. Also I'm pretty sure I have more than half of those on the Wii/U VC anyway that's already hooked up to the tv with wireless controllers. Little surprised they didn't add Super Mario All-stars . Because Mario All Stars is 3 NES games? I wish I could get excited for this, but I'd rather have the games in Virtual Console on my WiiU (or Switch if I buy one). Plus, I'm not going to drive myself nuts trying to find one if they can't keep them in stock. I tried pre-ordering the NES Classic but it was barely available at Amazon, Best Buy, Target and Gamestop before they sold out. How is Nintendo going to change that for this SNES relaunch? What bothers me the most is that the only ones benefiting from this fiasco are the scalpers. Same way it was with the Amibos. Why the hell launch a product that has high demand but little supply because that's the way they do business? Even at $80, good luck finding one of these for the holidays before they cancel production for next year's N64 classic! I know you're joking but I don't think the N64's games have aged nearly as well as the rest. I tried Goldeneye a few years ago and it was nearly unplayable to me. Plus I doubt they'd get the WWE license for the wrestling games. I'll try to seek one of these out! The SNES is my favorite vintage console. The NES Classic appealed to me as I grew up with the original NES but never had an SNES. Not sure if I'll bother trying to get one of these or not. Since buying a Switch I think I'd rather wait for some of these games to come out on Virtual Console.